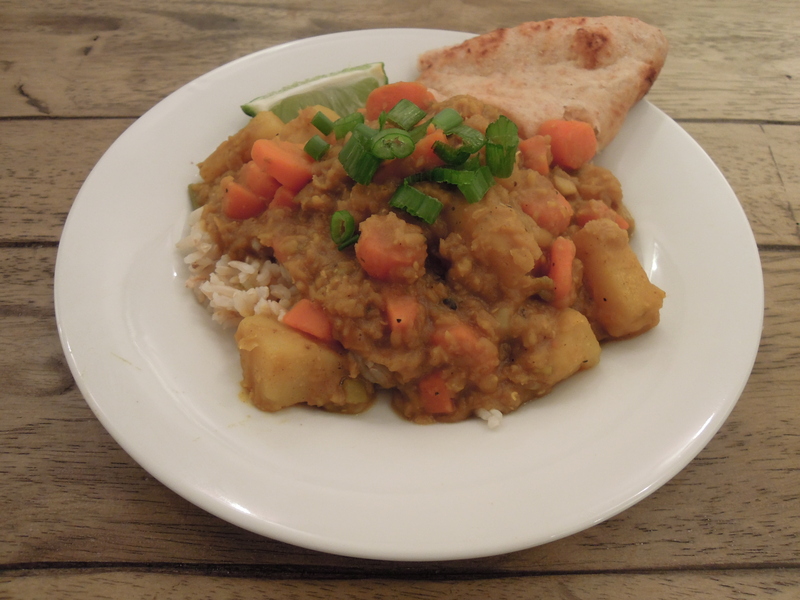 My little slow cooker has been quite busy this week–and rightly so. We’ve had some of the coldest days here in Chicago in years. Having lived in New York, Utah, Vermont, and now Chicago I like to think I’m pretty good about the cold. But the truth is all I want to do is snuggle up in about 10 blankets by the fire, drink tea, and read books all day. Since there’s life and work to keep up with, plus the fact that we don’t have a fireplace, I tried to create that same level of comfort with our meals this week. Not only does the slow cooker guarantee a warm-you-from-the-inside dinner, it makes the house smell incredible for hours, which is a kind of cozy, homey comfort for me. 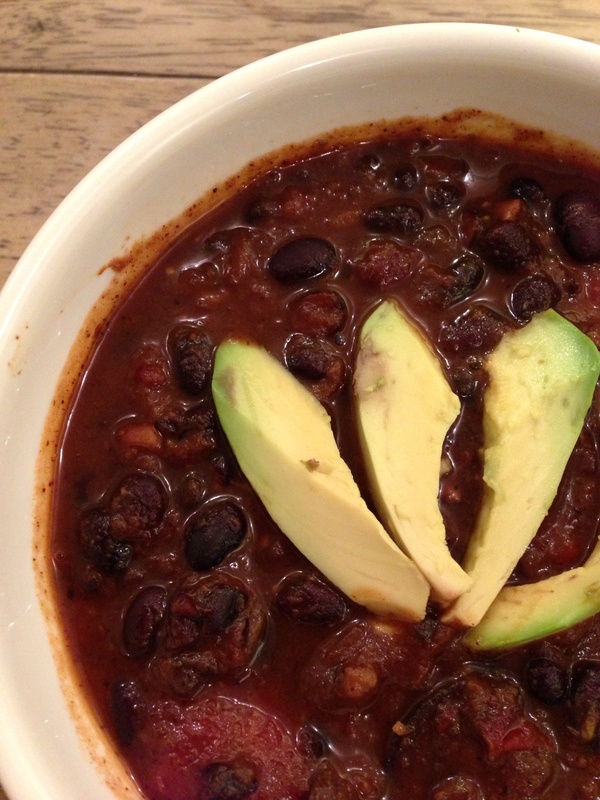 Let’s talk about this chili because it turned out even better than I imagined–and I already had high hopes. 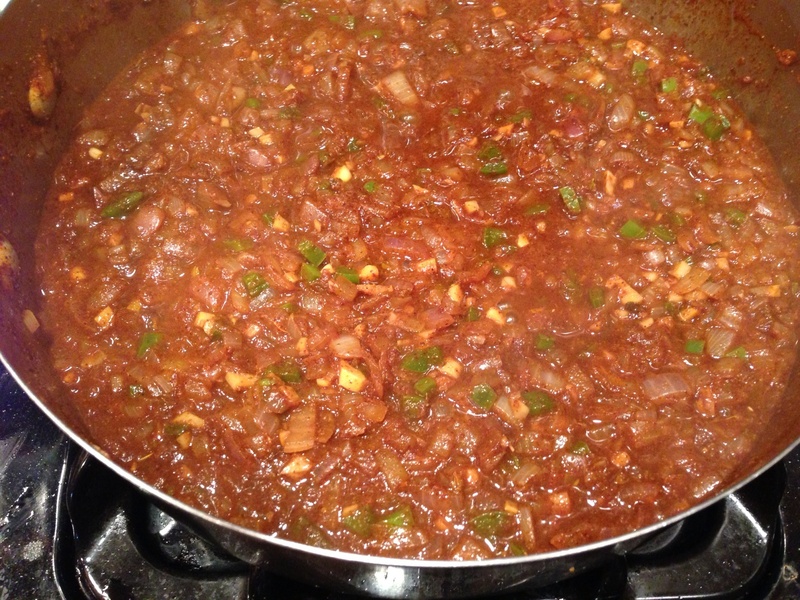 There are just so many different flavors: onion, garlic, jalapenos, chiles in adobo sauce, chili powder, cumin, and oregano. Get your spice rack ready! If you ever thought vegetarian meals are lacking in flavor (does anyone think that?) this meal would surely prove you wrong. Although the first few steps require a little more work than the typical toss in the slow cooker approach, they are so, so worth it. 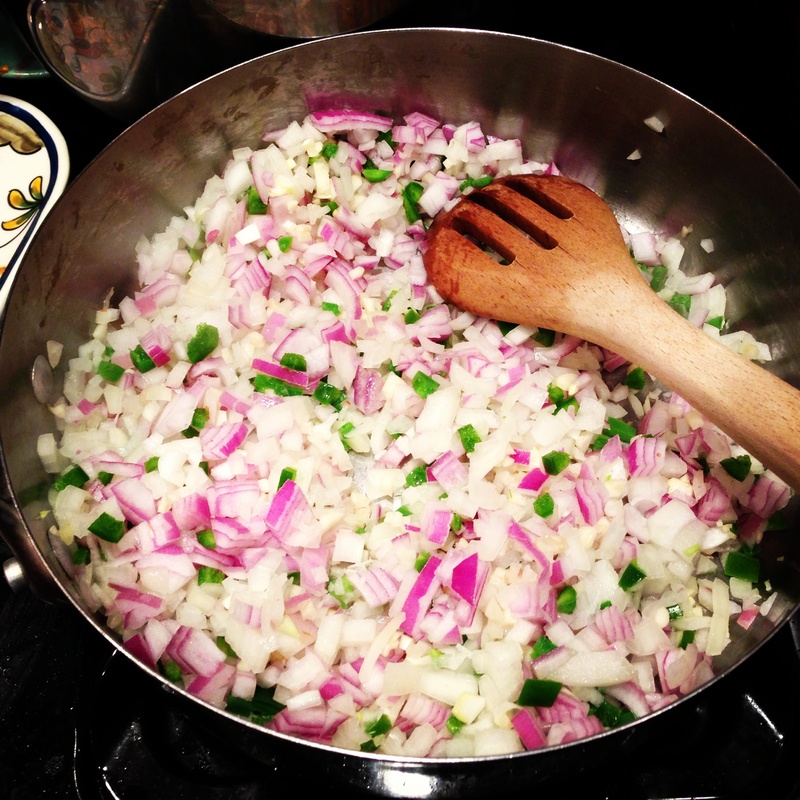 Just chop your onions, jalapenos, and garlic cloves. Sautee in some olive oil. Your home already smells amazing. Add your spices. Cook about 10 more minutes. Pour everything into the slow cooker. 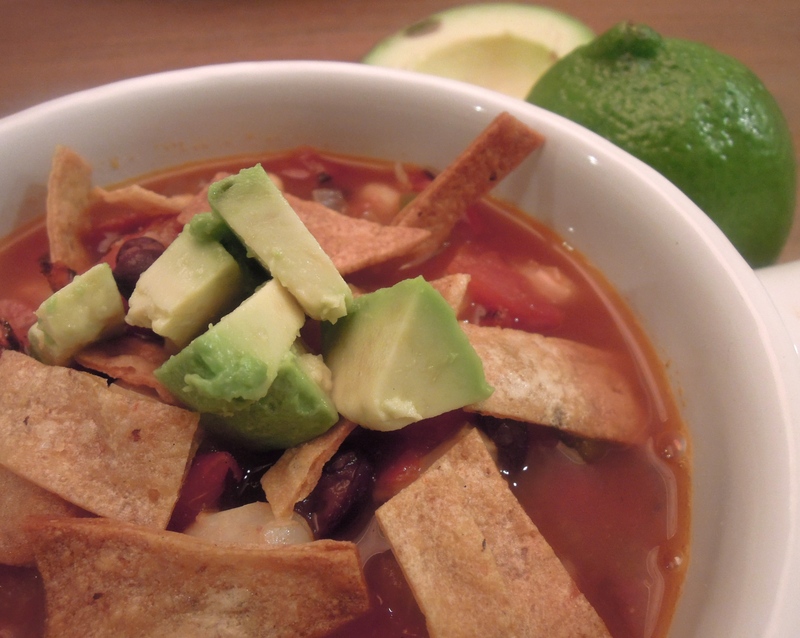 Garnish with plenty of fresh cilantro (not pictured) and sliced avocado. Serve over brown rice or quinoa if desired. Have a great weekend! I start Sculpt training tomorrow. Freaking. Out. 1. Heat about 1 Tbsp oil in large skillet over medium-high heat. Add onions, jalapenos, and garlic. Saute until fragrant, about 1 minute. Add chili powder, cumin, and oregano. Saute until vegetables brown and soften, about 10 minutes. Stir in 1 cup vegetable broth, scrape up any browned bits from the bottom of the pan. Add to slow cooker. 2. To the slow cooker add: remaining vegetable broth, water, beans, mushrooms, minced chipotles, adobo sauce, and bay leaves. 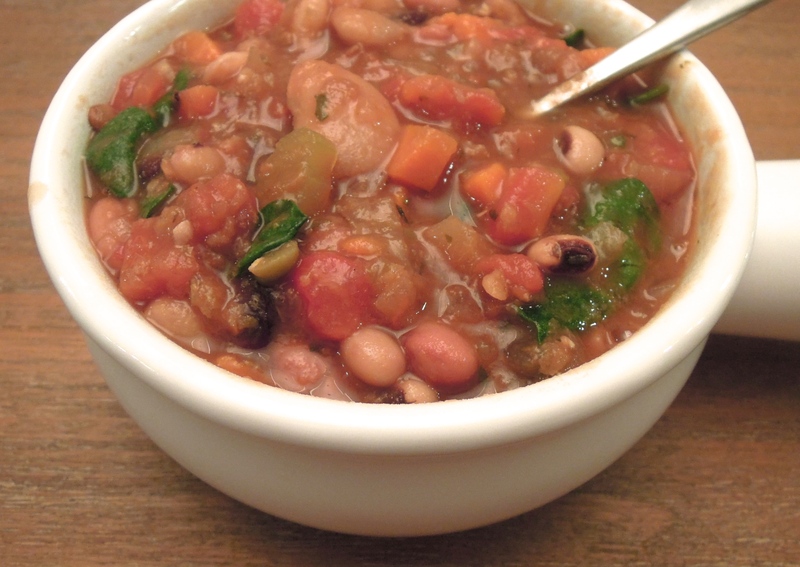 Cover and cook until beans are tender, 9 to 11 hours on low or 5 to 7 hours on high. 3. When done cooking, discard bay leaves. Transfer 1 cup of cooked beans to a bowl and mash with potato masher or back of fork until smooth. Return mashed beans to slow cooker. Add tomatoes into chili. Once heated through, about 5 minutes, season with salt and pepper to taste. Serve. 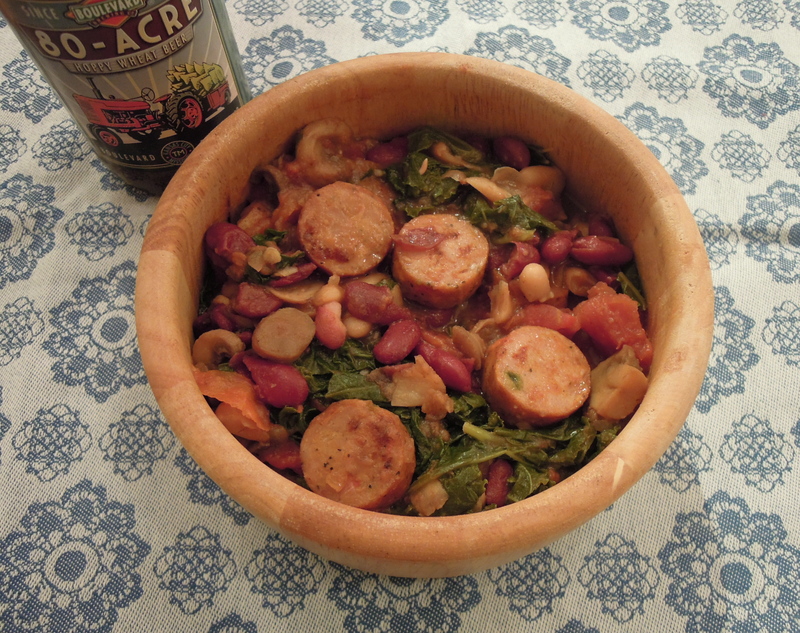 This entry was posted in Slow Cooker, Stew on January 25, 2013 by Paige Greenfield. You may recall about a month ago, while watching the Bachelorette wedding, my cable completely went out. It turns out the cable box had a heart attack and we didn’t get a new one for about 2.5 weeks. I can’t even begin to describe the positive impact going without TV (we couldn’t even get the basic channels) had on me during that time–and since. Robert happened to be traveling for work during those weeks (otherwise it probably would’ve been fixed sooner) so I was left to my own devices to entertain myself. What I discovered: Life without TV in the evening frees up an enormous amount of time. It’s awesome. In fact, some nights I got into bed by about 8:30pm because I wasn’t really sure what else to do. Bonus: I finished a few books way more quickly than I usually do. Now, don’t get me wrong I love TV. A lot. Often, it’s not what’s on TV as much as how relaxed and zoned out I feel while watching it. Plus, I love getting completely engrossed in shows (Homeland and Downton Abbey are some of our recent faves). And I can pretty much guarantee we’ll have a few Dexter marathons this weekend (we just started watching the first season). However, those 2.5 weeks were enough to break me of a habit: Eating dinner and watching TV every night until it’s time to go to bed. Lately, I’ve been cooking meals that take just a little bit more time to make (still, not more than 30 or 40 minutes on week nights). More importantly, I’ve really been able to enjoy the process more than ever because I’m not rushing through cooking so I can plop down on the couch ASAP to watch whatever’s on the DVR. If I make it there, great; if I don’t, well that’s great too. I hope you have a wonderful weekend. Thank you for reading! Heat oil in a large pan over medium-high heat. Add sausage and saute until browned on both sides, about 5-8 minutes. Remove sausage. 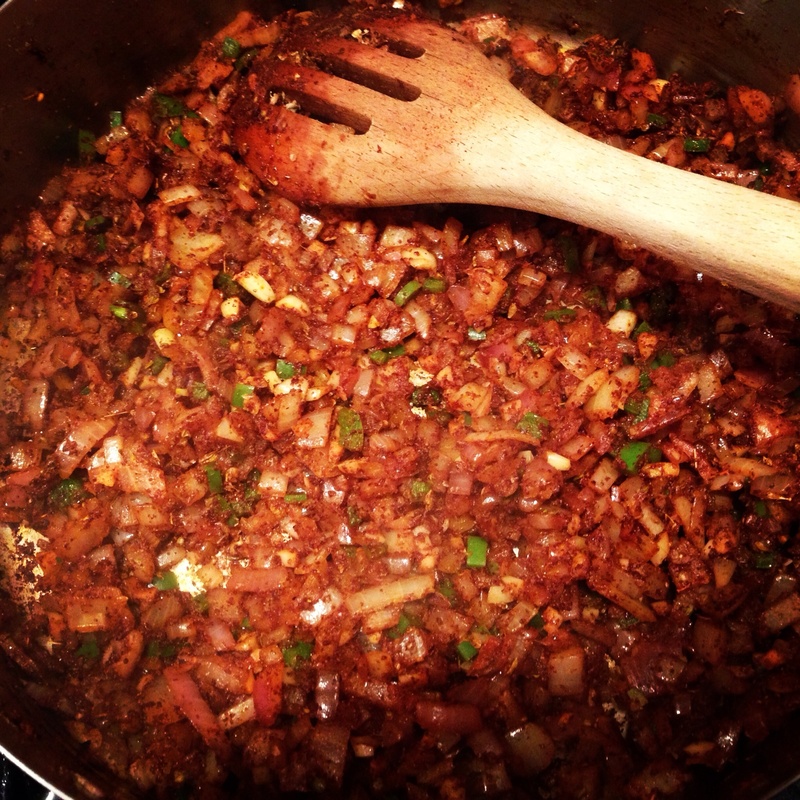 Add minced shallot, garlic, and mushrooms to pan. Saute about 2 minutes. 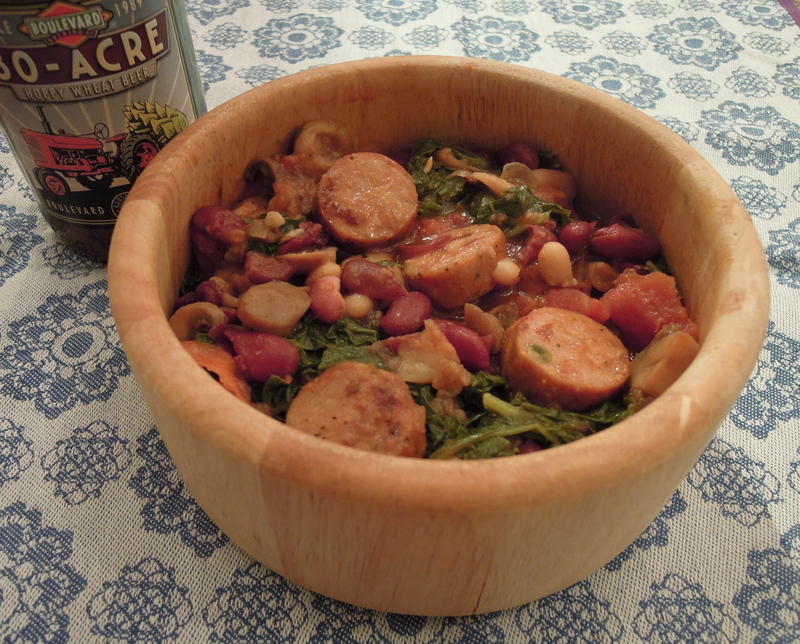 Pour about 1/4 cup beer into pan and use a wooden spoon to remove brown bits left from the sausage. Cook until mushrooms soften, about 5 minutes. 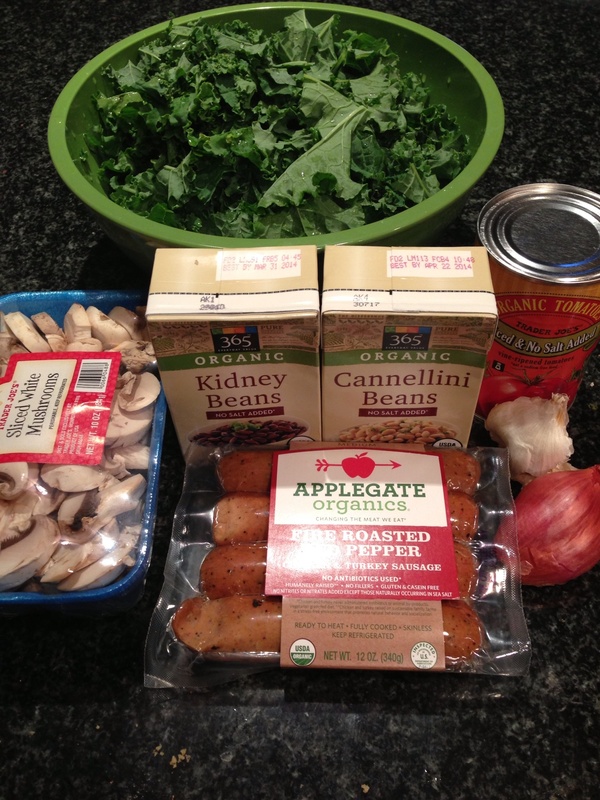 Add beans, tomatoes, and kale. Pour in 1/2 cup of beer. Cover and cook until kale wilts, about 5-10 minutes. Using the back of a wooden spoon, mash some of the beans to create a thicker consistency. Add sausage back into the pan and continue cooking until heated through. Add salt and pepper to taste. Sprinkle with red pepper flakes and serve immediately. 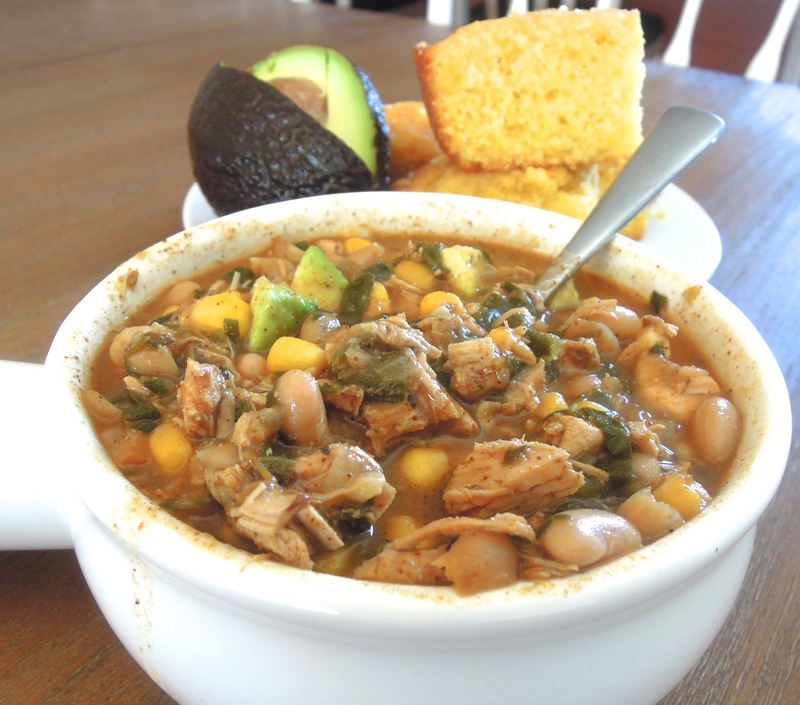 This entry was posted in Chicken, Stew, Turkey, Vegetables on January 11, 2013 by Paige Greenfield. Oh my, was this ever good. The meal came at a very much needed moment in my week. I’d had one of those days where I plugged away at my computer for eight or nine hours, yet hadn’t crossed a single thing off of my To Do list for work. (And I’m someone who puts items like “shower” and “eat lunch” on her list.) Still: Nada. Zilch. I’d shuttled off countless e-mails, yet no one responded. I left dozens of voicemails. No answers. I searched endlessly online for studies that I needed to no avail. It felt like I hit a dead end every time I attempted to inch forward in some way. What’s that? You know exactly what I’m talking about? The funny thing is, Robert came home from work that same evening saying he felt like he’d accomplished absolutely nothing that day. It’s a universal experience, right? And there’s something about a lack of momentum that can be exhausting. After yoga, I really just wanted to curl up on the couch until it was time to walk the dogs. Then I could crawl into bed at an hour that would only be acceptable for an infant or an 80 year old and try again tomorrow. But something deep inside propelled me into the kitchen to cook. Thankfully, I listened. Because when this meal was done not only had I made something absolutely delicious to eat, I felt a genuine sense of accomplishment. Progress. Success. So with a full belly and a peaceful mind, I finally slipped into bed knowing deep down that the hard work I put in that day would somehow make a difference the next. Satisfaction on so many levels. Heat oil in large sauce pan over medium high heat. Add garlic and scallions. Saute until softened, about 3 minutes. Add curry powder, stir until color darkens slightly, about 1 minute. Add carrots, potato, lentils, and vegetable broth. Bring to a boil, reduce heat, and simmer, stirring occasionally, about 20 minutes, until vegetables are tender and lentils are cooked. Serve over brown jasmine rice. Garnish with scallion greens, lime wedges, and naan. 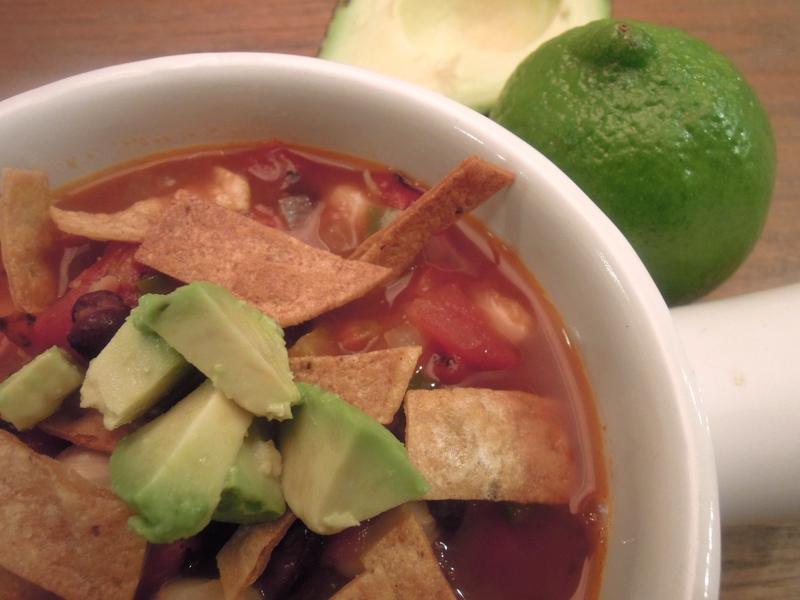 This entry was posted in Stew on January 10, 2013 by Paige Greenfield. There are some healthy foods that make me feel even healthier than others. I realize this is completely ridiculous. Like spinach? Broccoli? Eh, those are old-school healthy. Kale is better, but Swiss chard is like crazy-super healthy probably because it’s a mystery to me. I feel the same way about lentils. 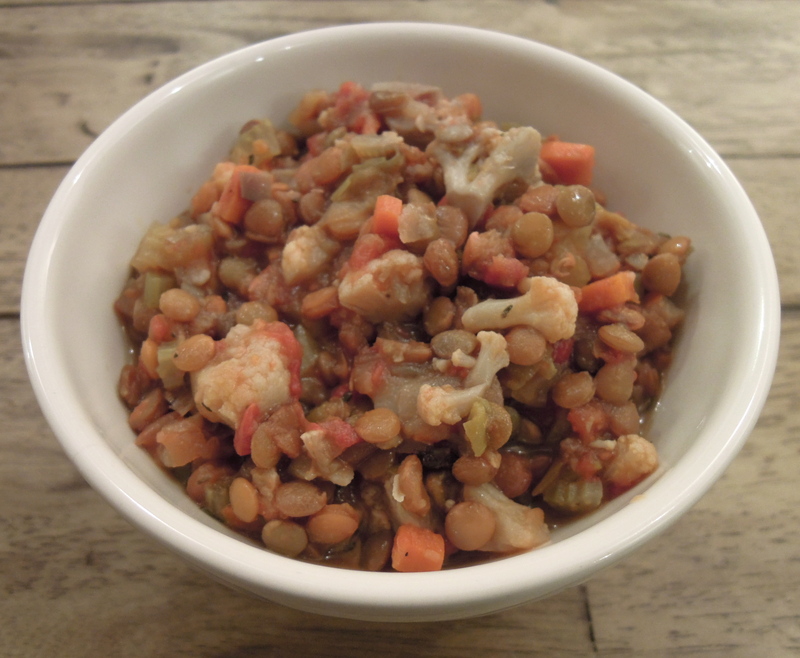 Once you put lentils into a meal it automatically shoots the health-factor through the roof. 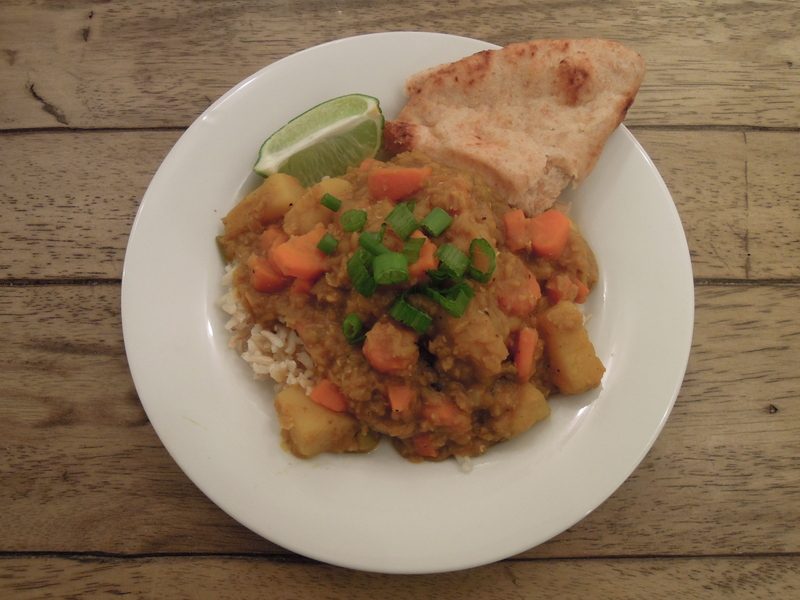 It’s practically impossible to make an unhealthy meal once you’ve added lentils into the mix. Only good things can happen. Every time I cook lentils I think of Dr. Oz. I remember reading an article in Time magazine about how he cheated before undergoing a colonoscopy and ate the day before. During the test his colon was dotted with lentils, which obscured the result. I’m not sure why that stuck with me, but it’s probably because it’s just totally absurd. You blew your colonoscopy because you ate lentils? Seriously Dr. Oz? The story would’ve been way better if his colon was clogged up with a cheeseburger. Truth be told, I have iffy feelings about veggie stews because they can end up kind of mushy (gross), but this meal fell into no such trap. The carrots, cauliflower, and lentils maintained a slight firmness to them even after hanging out in the slow cooker for 8 hours. 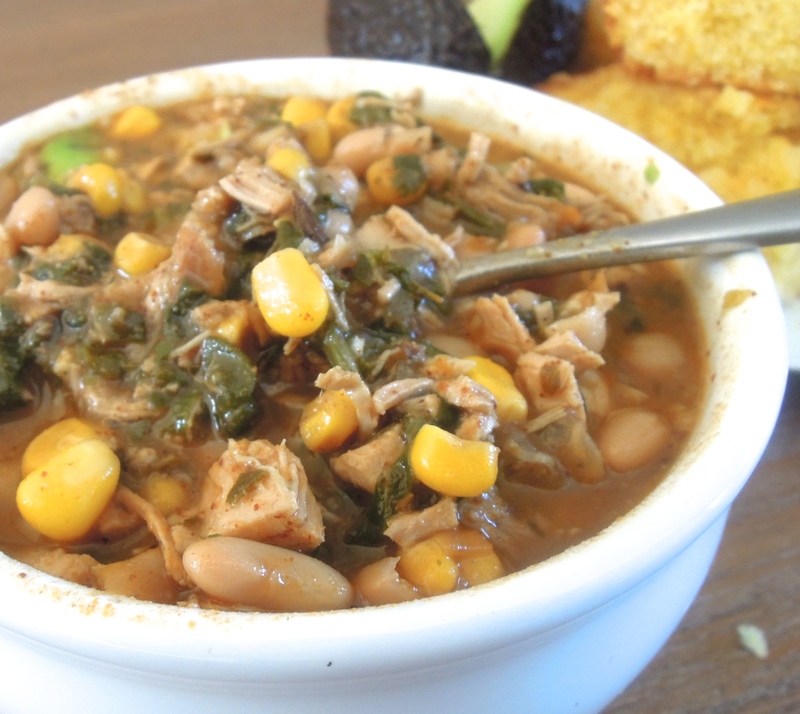 Meanwhile, the flavors totally melded together–just as they should in a stew. It tasted earthy, a little bit spicy, and just a bit sweet. I loved, too, how every bite was packed with so many different ingredients. It’s a huge bonus, but I’ll admit the prep requires quite a bit of chopping. Problem solved: I chopped all of my veggies the night before and stored them in reusable containers in the fridge (see below). They were ready for action the next morning. Combine onion through salt and pepper in a microwave-safe bowl. 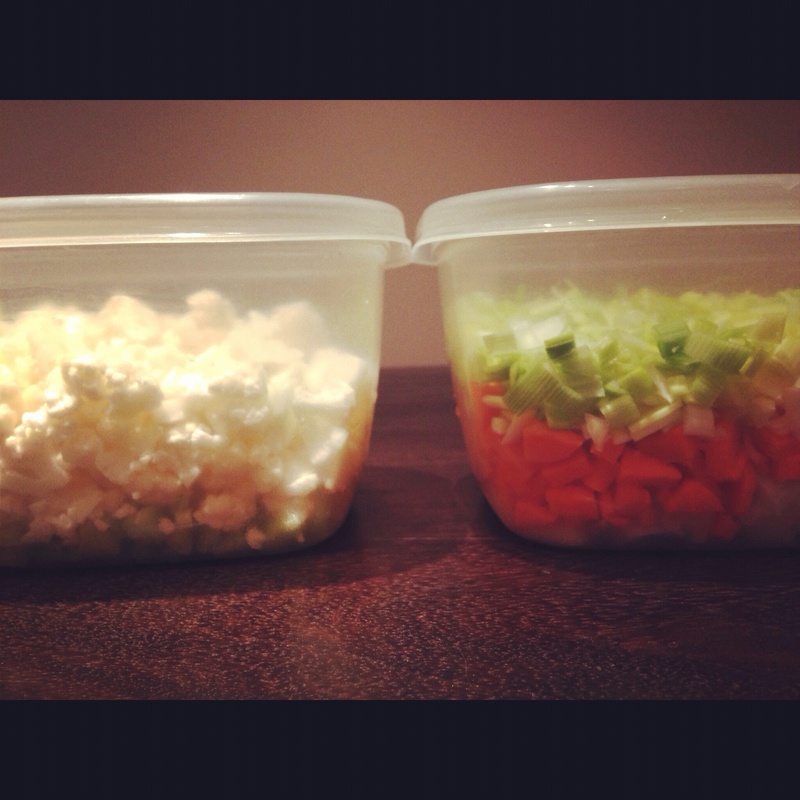 Microwave on high for about 6 minutes, stirring occasionally, until onion and carrots soften. Add to slow cooker. To the slow cooker add cauliflower, lentils, tomatoes, and broth. Cover and cook on low for 8 hours. 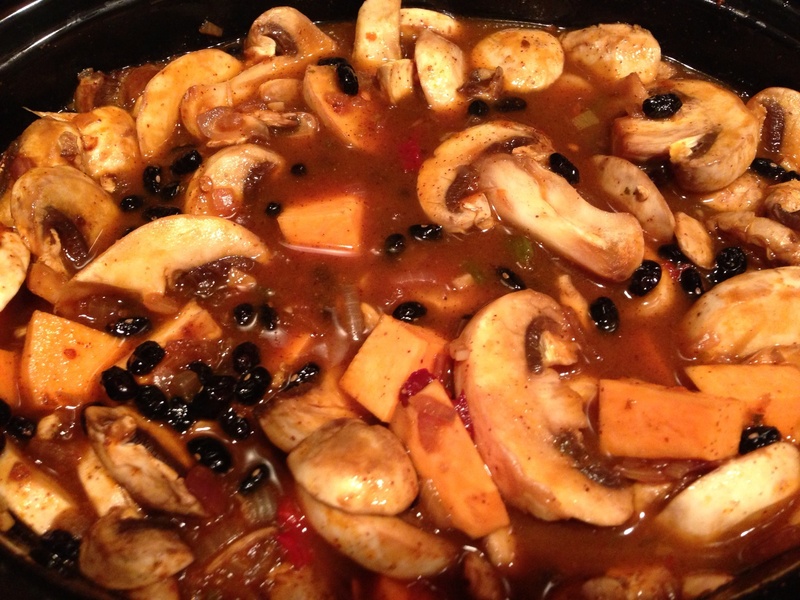 This entry was posted in Slow Cooker, Stew on November 18, 2012 by Paige Greenfield.